The VenaPulse® Hands-Free Augmentation Device provides a portable and ergonomic advantage for vascular technologists performing venous insufficiency exams. The device rapidly inflates and deflates tourniquet pressures with a foot switch giving your hands more freedom and facilitating the intensive task of vascular imaging. Get consistent, reproducible augments without the bending, twisting, and repetitive motions that may lead to injury. 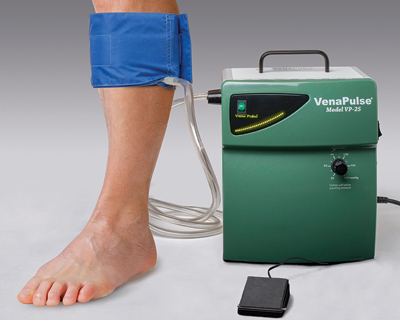 The VenaPulse® device allows for quicker and more comfortable venous testing for both vascular technologists and patients. Save time (and your back) as you efficiently scan! Even in clinics with multiple exam rooms, the self-contained VenaPulse® device is easily carried to wherever it’s needed. Its compact, integrated design provides vascular technologists with simplicity and convenience. 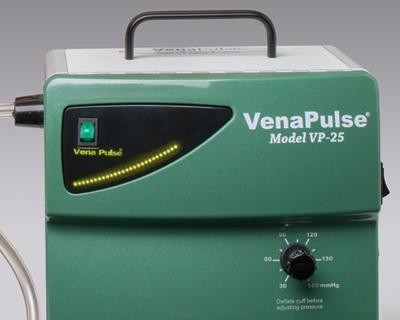 The VenaPulse® device’s primary purpose is to increase efficiency in vascular labs by eliminating the need for a second technologist to do hand augmentations. By using the foot switch to perform augmentations, one tech is all that is needed to perform a venous exam. Furthermore, the device controller’s bilateral capability can make an exam fly by. 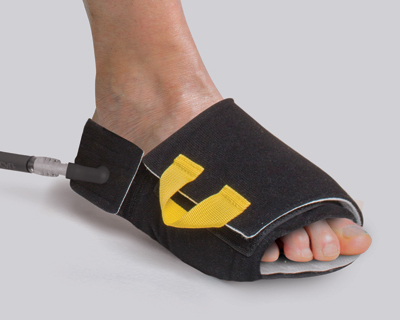 Our patented foot cuff is the ONLY inflation cuff that is specifically designed to rapidly empty the foot veins. It allows unobstructed imaging of the entire limb and the foot cuff alone can identify valvular reflux up through the sapheno-femoral junction in most patients. By generating static, tourniquet pressure to limbs of patients undergoing vascular testing, a vascular technologist can perform exams without worrying about variance in augmentation pressure. Our specialized rapid inflation cuffs allow every augmentation to yield predictable results. Technologists also have the option of placing the calf inflation cuff anywhere along the patient’s leg. 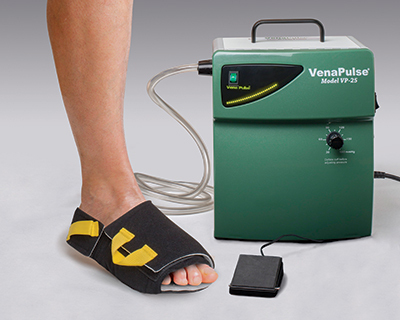 The VenaPulse® device’s tourniquet pressure is reached very rapidly and the tourniquet cuff is deflated very rapidly: approximately 300 millisecond rise and fall times. Inflation and deflation can be controlled either with a foot switch or with a manual switch. The recommended pressure is between 80 – 120 mmHg. Safety alarms are in place to ensure safe operation. Built-in safety alerts ensure safe operation of the VenaPulse® device. In the event of excessive cuff pressure, internal mechanical or electronic failures, an alert will sound, the cuff will deflate, and the front display panel will indicate REPAIR. *Please note that patients may be in a standing, sitting, or reverse Trendelenburg position while the VenaPulse® device is applied. The device is simply designed to replace manual augmentations. All accessories are included with purchase from ACI Medical. All of ACI Medical’s products are available to the public.